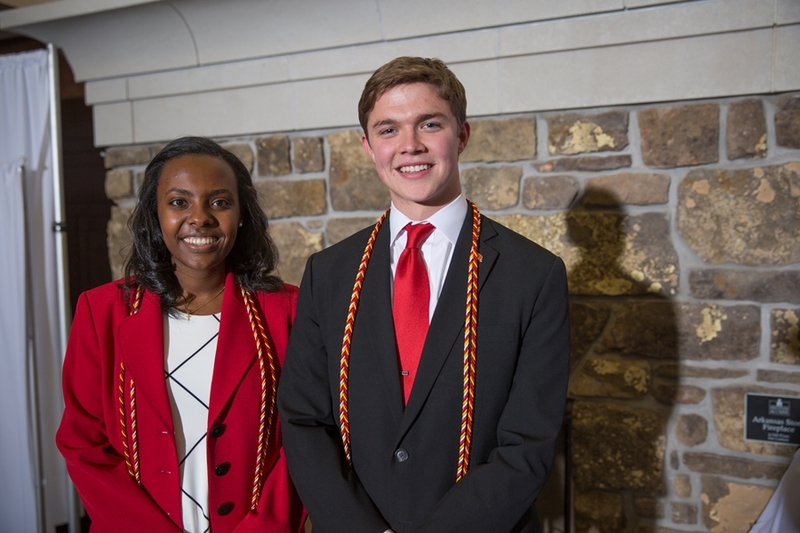 Ailon Haileyesus and Tanner Bone were awarded the Senior Honor Citation May 5 during the Cardinal and White Banquet at the Janelle Y. Hembree Alumni House. FAYETTEVILLE, Ark. — The Arkansas Alumni Association is proud to announce the winners of the 51st Senior Honor Citation. Ailon Haileyesus and Tanner Bone were announced May 5 during the Cardinal & White Banquet at the Janelle Y. Hembree Alumni House. This honor recognizes the top two seniors on campus. The award was announced at the conclusion of the banquet by Vice Chancellor Chris Wyrick and they received honor cords from Chancellor Joseph Steinmetz. Haileyesus and Bone received a life membership in the Arkansas Alumni Association, permanent recognition on a plaque at the alumni house and are invited back for events, including speaking at their class' Senior Walk Dedication. Haileyesus, graduating with a bachelor's degree in biomedical from the College of Engineering, said she was surprised and elated upon hearing she was one of the Senior Honor Citation recipients. "Receiving this recognition is a tremendous honor. I would like to extend my gratitude to professors, friends, and family on campus and across the world. I have been very blessed by these people – including my academic adviser Dr. Michelle Kim and research mentor Dr. Kartik Balachandran – who have challenged me and been instrumental in equipping me to push forward," Haileyesus said. "The University of Arkansas has provided many opportunities for students in research, international travel, student organizations, and much more; I am glad that I took advantage of these resources and that the university has recognized my efforts. This is a great motivator to continue my ambition of making a global impact." Haileyesus is president and co-founder of the U of A chapter of Engineering World Health, and after completing her graduate studies, Haileyesus plans to obtain a doctorate in biomedical engineering to design inexpensive technology that will revolutionize the way medicine is practiced, enhancing the quality of health in developing countries. Bone, graduating with a bachelor's degree in international business with a concentration in economics, is president of the Associated Student Government, vice president of sponsorship on the Student Alumni Board and treasurer of Phi Delta Theta. Bone said "it was humbling and honestly surprising" to find out he was awarded the Senior Honor Citation. He added that receiving this honor is a direct result of the investment that many have made in him over the years. "I have been challenged and encouraged by so many peers and mentors throughout my time as a student here, and the opportunities I have had on campus and in the community is because of them. The Razorback community is special, and my receiving the Senior Honor Citation is a reflection of so many who have been such an influence on me." The banquet also featured recognition of the 2016 Razorback Classics, which are the top 11 male and top 11 female graduating students at the University of Arkansas. All of the Razorback Classics recipients will be featured in the Razorback yearbook and Arkansas magazine and receive a free membership in the Arkansas Alumni Association. This is the pinnacle of the Arkansas Alumni Association awards program that started with over 500 nominations in the fall. The selection committee of almost 100 alumni and administrators, who were previous winners or members of the Arkansas Alumni Board of Directors, read through each application. The students are judged on academic excellence, leadership and campus or community involvement. This award looks at the entire student experience, said Ryan Miller, associate director for student & young alumni outreach. In the fall, seventy-one graduating seniors were selected as the 2016 Class of Seniors of Significance. These students were then able to update their applications for consideration in the spring. From this group, 20 were selected as this year's Class of Razorback Classics, along with the two Senior Honor Citation winners. Kelsey Wheelhouse, Sam M. Walton College of Business, Bentonville.